60 MINUTES’ HIT PIECE JOURNALISM AGAINST ISRAEL…….. – The Tundra Tabloids……. 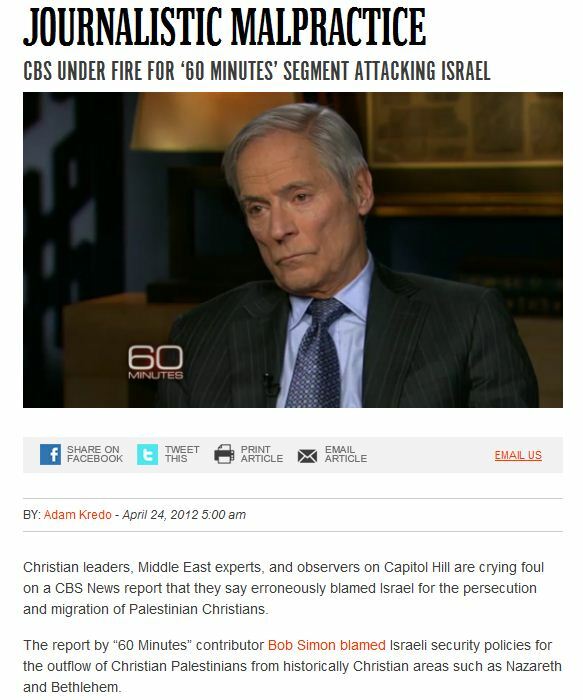 60 MINUTES’ HIT PIECE JOURNALISM AGAINST ISRAEL……..
Leftist media bias naked like, for all to see. The depletion of Christians from tradtional cities and towns throughout the P.A.administered areas in Judea and Samaria, are due to heavy handed Muslim policies, nothing more, nothing less. One of the very first things Arafat did when he set up shop in Ramallah, was to include towns and villages outside of Behtlehem, into the city, thereby driving up the demographic number of Muslims. The result has been a dramatic change in the population, where Christians once held 80% of the majority, now make up 20% of that city, or even less. Justus Weiner has done a monumental work in exposing the real problems facing the Christian community in the Muslim Arab administered areas of the P.A., having interviewed a large number of these arabs, and sadly he was never contacted by the 60 Minutes Crew. They wouldn’t want to hear what he had to say because they were seeking a narrative all of their own, which is based on pure fiction. Previous Post Previous Post REMEMBERING THE ARMENIAN GENOCIDE AND TURKISH DENIAL……..
Next Post Next Post RAYMOND IBRAHIM: THE JIHADIST ROOTS OF THE NORWAY MASSACRE……..